I know that this community has a general dislike of Birkenstocks (and sandals in general). I, however, do not. Of course, stuff like this (http://www.shoeandboot.co.uk/assets/mens_sandals.jpg) is to be avoided at all cost. Unfortunately, many peoples' opinions are colored by sandals (and the mortal sin of sandals and socks) being worn by folks like this (http://styleblueprint.com/wp-content...ps-620x413.jpg). On top of that, the current dominant style: Ivy prep, which I personally loathe (I cannot stand boat shoes and polos), frowns on sandals. If you are in a casual setting, keep your toenails trimmed and feet clean, and your sandals are not clunky, I don't see any problem with sandals (Let's not forget all the greats whose feet were graced by sandals: Jesus, Gandhi, Augustus...I rest my case). Alright, that's enough of a preamble/disclaimer. 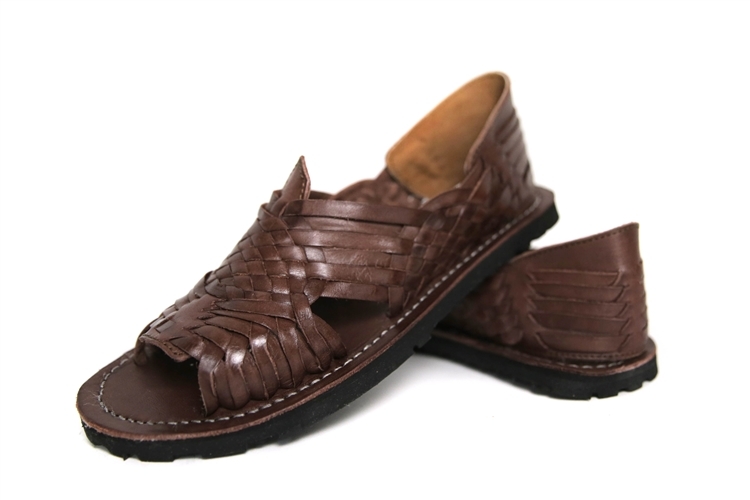 I do a lot of work in Mexico, and lots of men here wear huaraches (usually something similar to this: http://cdn3.volusion.com/drk7m.puwj5...rown_Men-3.jpg). They are way cheaper than Birkenstocks, which I like, but can't justify buying at ~100 bucks a pop. I was wondering how these would be received if seen in the US with a pair of well-fitting shorts and shirt? Bear in mind that I am a granola munching, folk and psychedelic rock loving, Sierra Club member. It's only one opinion, but I think those are hideous regardless of the styling of the rest of your clothes. If you are in a casual setting, keep your toenails trimmed and feet clean, and your sandals are not clunky, I don't see any problem with sandals (Let's not forget all the greats whose feet were graced by sandals: Jesus, Gandhi, Augustus...I rest my case). I was wondering how these would be received if seen in the US with a pair of well-fitting shorts and shirt? Where are you gonna wear these, though? I don't mind seeing them worn (by a customer) in Starbucks, complementing shorts and a guayabera, in Southern California. Are you planning on wearing a linen robe, dhoti, or toga like Jesus, Ghandi, and Augustus too? There is a significant amount of hate for these type of shoes on this board. I'm pretty neutral: not gonna go out and buy them, but would wear them if given a pair especially in and around the beach. They're probably more comfortable in very hot climates than 90 percent of footwear. I'd wear them with lightweight pants rather than shorts since I never liked a pair of dark shoes contrasting with my bony white legs. I'm in NY. As I said, I dislike most shoes which typically complement shorts, so I was thinking making these+linen shorts+a OCBD as my go to summer wear when it's nice and sunny out. They look proper in the parks, and even certain museums. What's your opinion on Birkenstocks? What about these: http://www.ebay.com/itm/LEATHER-MEXI...-/330870717893 ? I do a lot of work in Mexico, and lots of men here wear huaraches (usually something similar to this: http://cdn3.volusion.com/drk7m.puwj5...rown_Men-3.jpg). They are way cheaper than Birkenstocks, which I like, but can't justify buying at ~100 bucks a pop. I like them a lot. Where can I get a pair (other than in Mexico)? I don't like those ones at all. But that's just my opinion.